← Shanghai Part 3: Sunday Brunch and Afternoon Tea! 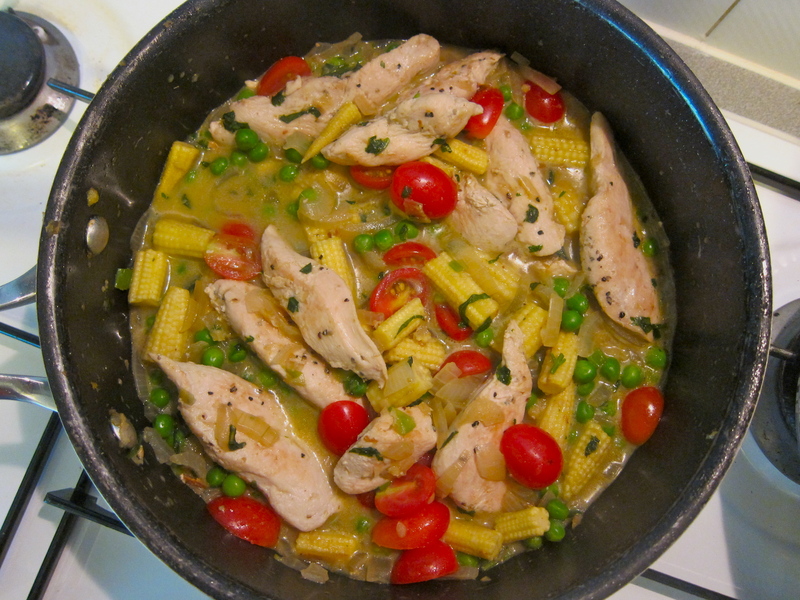 Have you invited someone over for a hot dinner date but you don’t have any idea what to cook? Or perhaps you like to go for a workout at the end of a long day, and by the time you get home you don’t have time to buy ingredients for a meal. Or maybe you like to cook but you just can’t be a*sed to chop stuff up. Well then, Secret Ingredient is right up your alley. 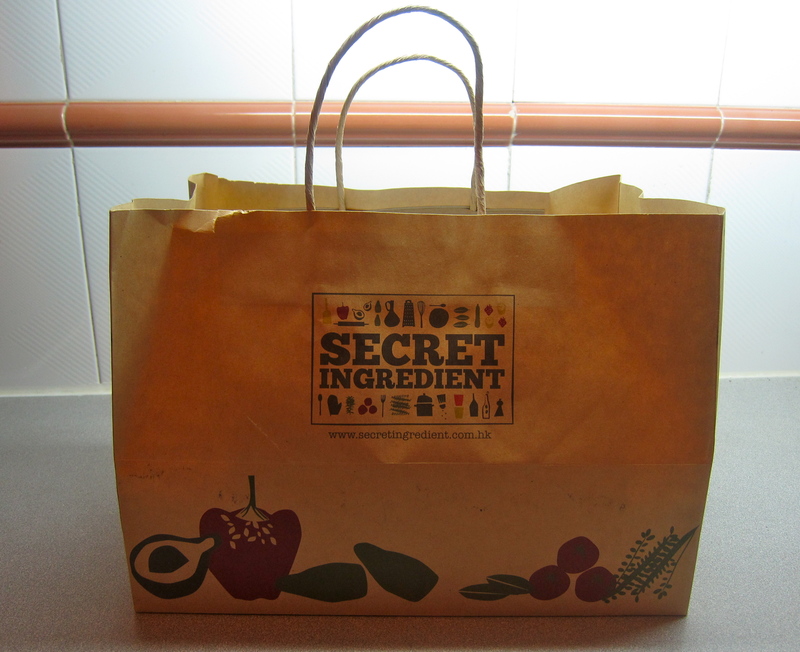 I’d heard about Secret Ingredient through my foodie friends, and thought it was the perfect thing for busy Hong Kongers. The concept is simple – you go on the website and choose a meal that you like the look of, each meal is $275 (or thereabouts), and serves two. They will deliver all the ingredients you need to your door (even the olive oil), chopped up, seasoned, portioned and ready to go. I’m sure many of you, like me, have bought all sorts of fancy pots and gadgets that you plan to use one day; I’m sorry but this is not the day – all you need is a couple of pots and a few implements. We are the ‘the exercisers’ – if it’s a run day, we usually don’t get home until 9pm, and after preparing a meal, we don’t eat until about 10pm. 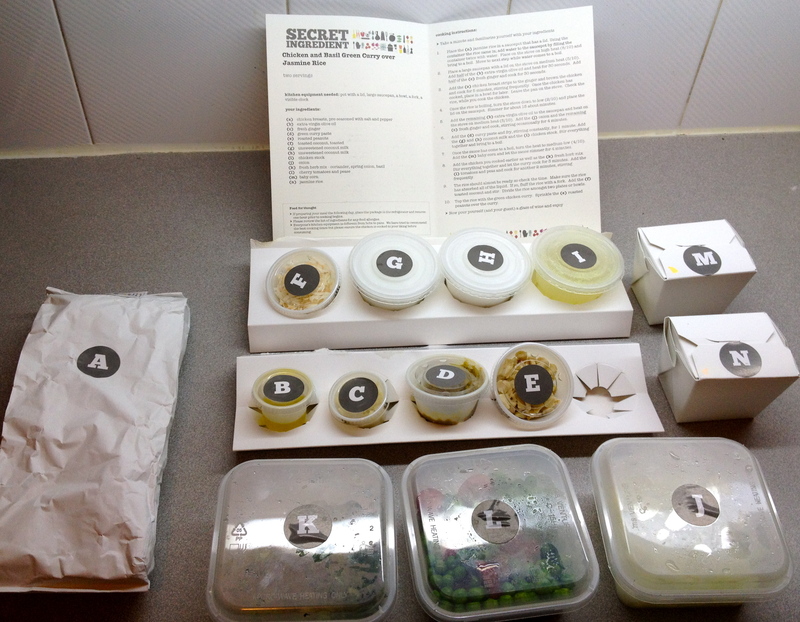 Secret Ingredient is perfect for these days – I chose the Chicken and Basil Green Curry and Jasmine Rice. I ordered it to be delivered at home between 7pm-8pm, and it arrived at 7.15pm, perfect timing! You can also have it delivered to your office if you wish, at the moment they deliver to several areas on HK side (apart from South Side). 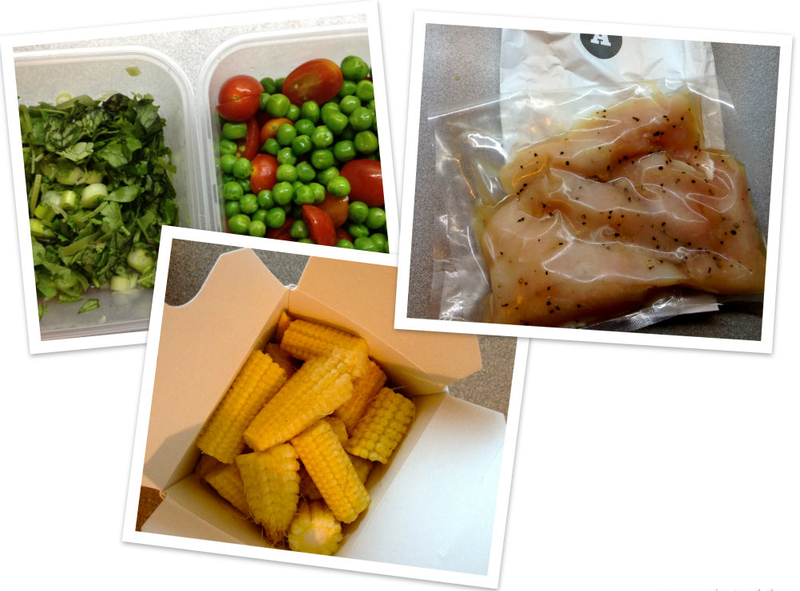 All of the ingredients are labeled and come with step by step instructions on how to cook your dinner. One pan for the curry, one pot for the rice. 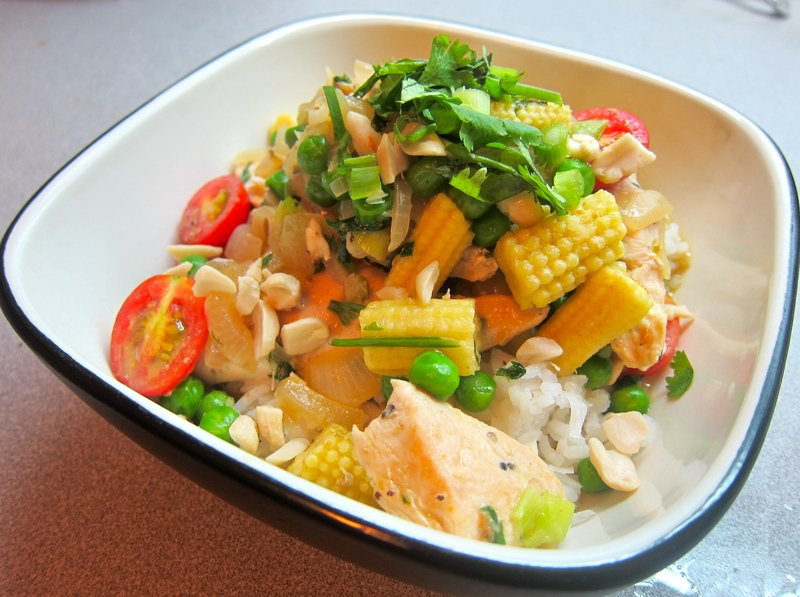 While not exactly an authentic Thai Green Curry, it definitely hit the spot! SI changes their options every two weeks so you have something different to choose from, and they deliver every day apart from Saturday. You can also buy in multiples for a dinner party, and they recommend that you call them up to see if you need to tweak any of the cooking times. The best thing about this meal? Neither did I use one chopping board, nor one knife! I hardly had anything to clean up and we had FUN cooking it! It certainly can’t replicate the pleasure and pride you feel when cooking a meal from scratch for your friends and loved ones. Choosing the ingredients, chopping them up with patience and cooking a recipe with love are still all valued processes – but if you need a good, nutritious, easy and yet interesting meal in a jiffy, this is is. Plus I got some great recipe ideas: for instance, I’ll be adding toasted coconut flakes to my steamed rice from now on – yum! The only con is the amount of plastic that you’re left with at the end of it all. Imagine that x 100 dinners – that’s a helluva lot of plastic! 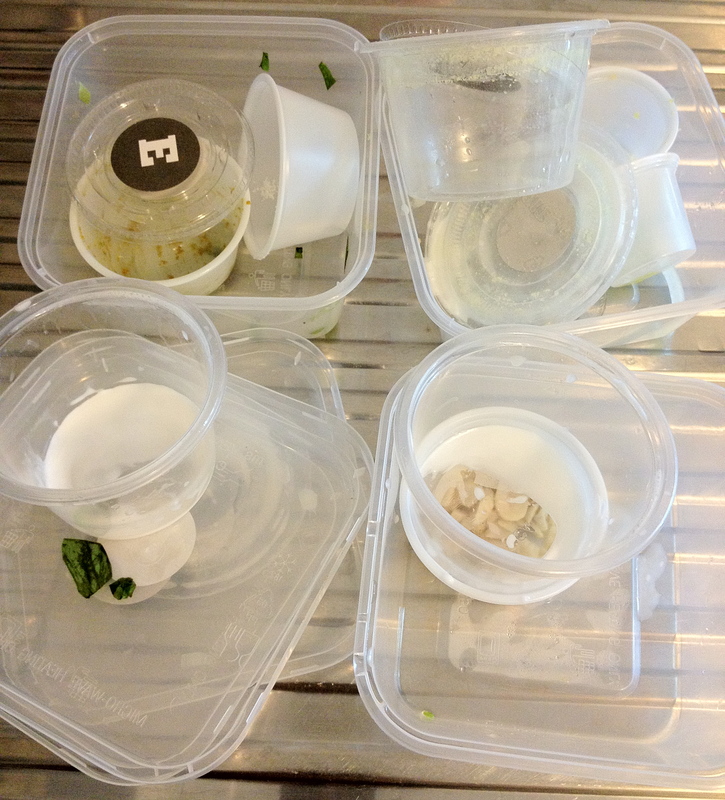 They are all good-sized and good quality containers, so I’ve washed mine and will be reusing them. I purchased coupons off the Sassy Sales website to try out the Secret Ingredient experience at 50% off (that’s $137.50 for a meal for two!). The deal is no longer available, but who knows, perhaps if I ask, I can organise a LoveBites deal 🙂 If you seriously want to try it out, please comment below with “I want to try it! !”, and I’ll see if we can sort something out!